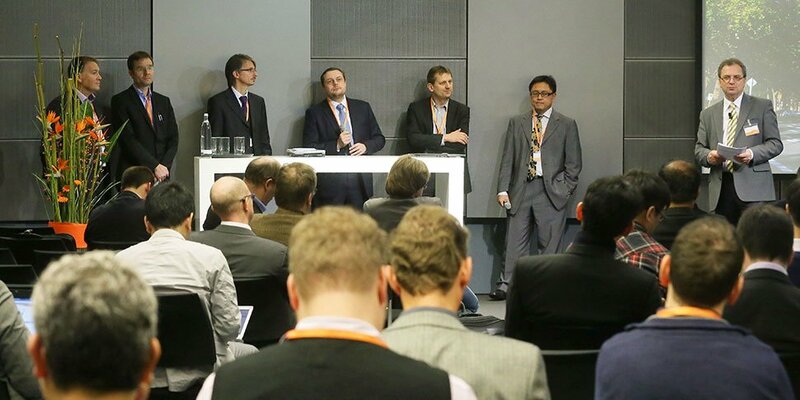 FFF 2013 was the fourth event of the FOKUS FUSECO Forum series and looked at fixed and mobile Next Generation Networks Evolution towards virtualized network control and service platforms and seamless Cloud-based H2H and M2M applications. So again we followed our tradition and incorporate new trends within the established tutorial and workshop streams, such as Network Virtualisation and Open Flow, cloud-based human-to-human (H2H) and machine-to-machine (M2M) service provision, as well as recent advances in WebRTC and HTML5 technologies. 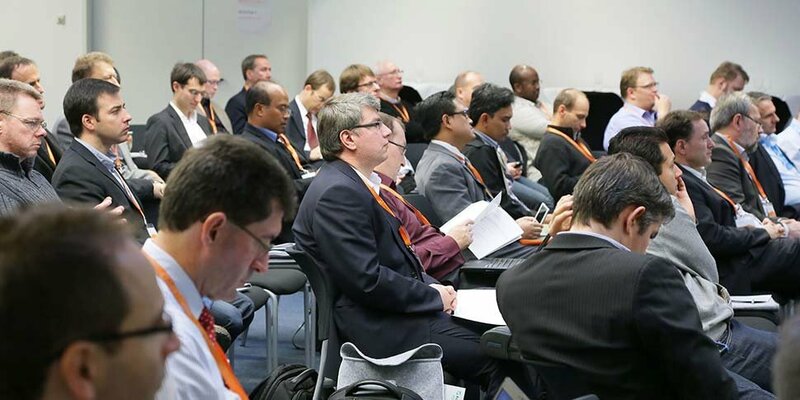 The FOKUS FUSECO FORUM (FFF) 2013 has been the fourth event in a successful series of FFF and attracted again around 250 academic and industry telecommunication specialists from 30 different counties. Two full days with technical tutorials, workshops, conference, booths and live demonstrations have been arranged. At the end of day one, a large social event - as a regular happening for the successful FUSECO series – took place in one of Berlin's famous clubs named ADAGIO. As part of the evening, a keynote on "New Strategies for Network Operators to assure Innovation and Sustainability in a new Competive Environment / Smart Cities" given by Heinrich Arnold (Deutsche Telekom AG, Germany) has been presented. The FUSECO Forum has been proven again to be a unique annual event, providing a networking and technical discussion platform for international network operators, standardization development organizations, and leading academic organizations dealing with the evolution of service control platforms for fixed and mobile next generation networks towards Smart Cities. Day one on FUSECO has started with four parallel streams with tutorials and workshops, which found large attraction. The conference day of FUSECO managed to bring together further aspects of day one in form of four sessions with presentations and a panel. As part of the demonstrations the new features of OpenEPC Rel.5 - Open Evolved Packet Core has been presented, OpenSDNCore - The Future Massive Broadband Communications Platform have released officially and OpenMTC Rel.2 has been presented to the public. Tutorial 1 "Understanding NGN Control and Service Platform Evolution – SDP/IMS/MTC/EPC vs. Clouds/OTT/WebRTC/HTML5“ performed by Prof Dr. Thomas Magedanz and Dr. Niklas Blum was attended by around 80 delegates and set the floor for this year`s FUSECO Forum. It introduced Smart Cities as a major Future Internet research use case which now becomes very relevant for the industry. The tutorial introduced all relevant technologies and showed the evolution path from Next Generation Network Service Delivery Platforms towrads cloud-based enabler platforms for diverse Smart City applications, such as eGovernment, eHealth, Smart Energy, etc. The tutorial was closed by an overview of the relevant FOKUS toolkits to prototype Smart City applications. Abstract - Tutorial 1: "Understanding NGN Control and Service Platform Evolution - SDP/IMS/MTC/EPC vs. Clouds/OTT/WebRTC/HTML5"
Due to the ongoing convergence of telecommunications, Internet and entertainment, and the increasing adoption of Internet technologies in our daily lives, we are moving rapidly into a world of total interconnection of humans and machines. This means that after Fixed Mobile Convergence (FMC) and voice/data integration which has coined the evolution of telecommunication infrastructures in the last decade, we are now witnessing the start of a much broader convergence of quite different application domains with different value chains and technologies. This convergence is driven by the adoption and extension of Internet technologies in various application domains under the banner of the Future Internet (FI), which today is getting a lot of attention by the increasing notion of Smart Cities, the Internet of services (IoS), Internet of Things (IoT) and Machine-to-Machine (M2M) communications. Thus different transport and control platforms need to be integrated into a Future Internet service platform enabling an open set of application domains by so-called common or generic enablers on top of different fixed and mobile network infrastructures. The Telecom operator approach is also in face of this development highly challenged by Over-The-Top (OTT) service providers that use network infrastructures as simple bit-pipe providers. The OTTs make use of highly scalable, lightweight cloud infrastructures and web based technologies as REST, HTML5 and in the very soon future WebRTC for human-to-human multimedia communications. This half-day tutorial will provide an overview of relevant control platforms and the related standards in the context of fixed and mobile Next Generation Network (NGN) evolution towards the Future Internet (FI). Starting form Intelligent Networks (IN), we will look at the 3GPP IP Multimedia Subsystem (IMS), the 3GPP Evolved Packet Core (EPC) and the emerging 3GPP and ETSI/OneM2M Machine Type Communications (MTC) platform. In addition, we look at relevant Service Delivery Platform (SDP) concepts and related service enablers and Application Programming Interfaces (APIs) as defined by ETSI, 3GPP, GSMA and OMA for enabling seamlessly various applications on top of fixed and mobile networks. We also address the current state of the art in international Future Internet research performed in Germany, Europe, US, and Japan. Addressing the OTT evolution, this tutorial will provide an overview of current advances in cloud-based technologies and their integration with networks based on OpenFlow and current networking approaches. From a service layer perspective, an introduction into HTML5 and especially WebRTC will provide an overview of latest developments as currently under way by companies as Google for Android and hang-out and Mozilla for FirefoxOS. We will illustrate that operators can play a dominant role in the Future Internet context when providing the right infrastructures and appropriate interfaces to the right partners in the future. Finally, the tutorial terminates with an introduction to relevant toolkits and laboratories from Fraunhofer FOKUS and Technical University Berlin, enabling rapid prototyping for academic and industry research in the context of NGN to FI evolution. Thus we will briefly introduce the Open IMS Core, OpenEPC, and the OpenMTC toolkits, as well as the FUSECO-Playground and the Smart Communications Playground enabling comprehensive prototyping in the context of academic and industry research. The half-day interactive workshop 1 on “VoLTE/RCS vs. OTT - Challenges and Advances for Launching Successful Fixed and Mobile Broadband Services” was led by Dr. Niklas Blum from Fraunhofer FOKUS, Germany and Prof. Dr. Axel Küpper from Technische Universität Berlin / Deutsche Telekom Laboratories. The workshop featured ten presentations reflecting a Telecom and Internet/over-the-top (OTT) service provider perspective on service-related topics as RCS/VoLTE introduction, operator view on integration of carrier voice services with OTT voice, WebRTC and cloud-based service platforms for future rich communication services to be deployed in a global scope. 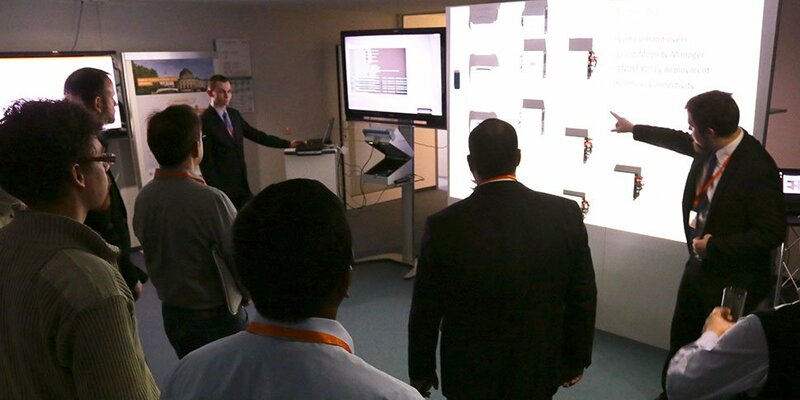 Presentations were delivered by A1 Telekom, Deutsche Telekom, Vodafone, Telekom Italia, Orange Labs, Google and NTT. A lively panel discussion about “Tackling Time to Market for Telco Service Provisioning – Platform Requirements and Business Opportunities” concluded this workshop. Selected speakers discussed with the audience their perspective on organizational, service and platform requirements to leverage innovation for real-time communication services, especially for carriers. One outcome of the discussion was that WebRTC should not be considered as a thread from an operator perspective, but rather provides the platform for global reach of operator communication services. Abstract - "VoLTE/RCS vs. OTT - Challenges and Advances for Launching Successful Fixed and Mobile Broadband Services"
The amount and variety of communication services in the Internet is rapidly growing. With the deployment of LTE as an all-IP bearer, Telecom operators and Internet service providers are now in direct competition. From a technical perspective service layer technologies for service development and deployment do not vary any more. This means that various models of cooperation and competition are possible and the innovative potential from the Internet could be leveraged directly for the user. This workshop addresses these topics from the perspective of the telcos and new players in the field of communication services that operators like to refer as over-the-top (OTT) players. 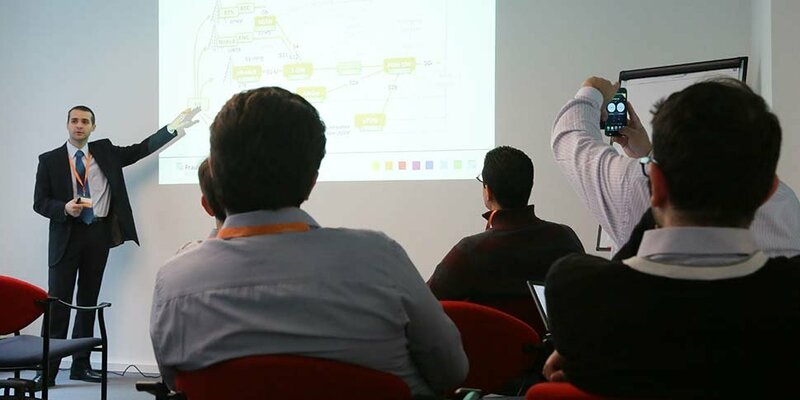 The M2M tutorial presented different M2M and IoT topics covering key technological and business aspects. The tutorial starred with the economic prospective, related business models, requirements and various challenges. Then it explained the M2M and the Iot terminology and the evolution path from M2M towards IoT. It gave a good introduction to the M2M standardization landscape and comprehensive comparison between ETSI M2M and oneM2M. Then it presented different M2M platforms and exposed M2M APIs offered by different operators. Finally the tutorial presented the OpenMTC Rel. 2 and related architecture and interfaces. The workshop is organized in two sessions: „M2M Platforms and Enabling Capabilities“ and „M2M Services & Applications“ and a panel. (Chairs: Adel Al-Hezmi, Fraunhofer FOKUS, Berlin/Jürgen Hase, Vice President M2M Competence, Deutsche Telekom, Germany/Timo Pötzlberger, M2M, Telefónica Germany GmbH & Ko. OHG, Germany). Both sessions addressed the current status of the M2M market from different perspectives presented by operators, industry and research. More than 40 persons participated in both session and panel. During the panel the panelist discussed the key current challenges for deploying M2M solution for enabling smart cities. Abstract - Tutorial 2: "M2M Communication Evolution: Motivation, Standards, Applications, and Tools for M2M and IoT"
Today the concept of mobile broadband communication is gaining momentum and the related 3GPP specifications are forming the technology foundation for enabling the connectivity for a massive number of devices. This communication opportunity is augmented by the development of new Over-The-Top (OTT) applications either imported from fixed Internet or especially tailored as mobile services. Apart from the user controlled smartphones, tablets, and laptops which are gradually adopted by mobile users, new devices such as sensors and actuators are currently deployed enabling the extension towards efficient remote communication of other business branches such as eHealth, eGovernment, eTransport Smart Grid, and Smart Cities systems. Smart Cities need a flexible M2M communication infrastructure based on convergent networks that lay the foundation for new applications and their flexible combination. This leads to new possibilities for the use of previously isolated applications and data that are now the basis for new business models. For example, environmental data can be combined with up-to-date values attained from within the building to ensure the more efficient and automatic control of heating and ventilation systems. A uniform M2M communication infrastructure can make those and many other applications possible in both the private and industrial sectors. Horizontal M2M communication systems that serve multiple vertical application domains are foreseen to become the nervous system of the city of the future. This tutorial will provide an overview of the future mobile networks and the correspondent standards. We will also look at potential application classes such as Over-The-Top (OTT) applications as well as service delivery platforms including the IP Multimedia Subsystem (IMS) especially from the perspective of the deployment of a massive number of M2M devices. Additionally, the novel ETSI M2M platform will be analyzed with respect to architecture, functionality, and interfaces underlining the potential of such convergence platforms. Finally, we will outline the major challenges which motivated the development of the Fraunhofer FOKUS / TU Berlin OpenEPC and OpenMTC platforms. Together, they form the FUSECO Playground, enabling industry players, namely network operators, equipment manufacturers, and service providers, to investigate the potential of EPC, MTC, and higher layer open service platforms within realistic development and execution environments. Tutorial 3 on "Getting started on your Core Network Evolution using OpenEPC: SDN and NFV" (Dragos Vingarzan, Fraunhofer FOKUS / Marius Corici, Fraunhofer FOKUS) presented a comprehensive overview of the 3GPP Evolved Packet Core standard, its evolution path and a preview of the new technologies enabling the operators to evolve their core networks beyond the current EPC, based on the Software Defined Networks (SDN) and Network Functions Virtualisation (NFV) paradigms. For both paradigms use cases were analyzed, technologies were presented and assessed, and the current industry deployment and interest were presented. Abstract - Tutorial 3 "Getting started on your Core Network Evolution using OpenEPC: SDN and NFV"
Workshop 3 on "Evolution of the Operator Networks beyond EPC: SDN, NFV and MCN" incl. also EU FP7 MCN Workshop" (Chairs: Thomas Michael Bohnert, ZHAW, Switzerland / Julius Mueller, TU Berlin, Fraunhofer FOKUS / Marius Corici, Fraunhofer FOKUS) organized a workshop consisting of two interactive sessions and one panel that brought together standardization organizations and network operators considering the evolution of the core network beyond the current LTE and EPC deployments specifically concentrating on the two most pre-eminent technologies, the Software Defined Networks (SDN) and the Networks Function Virtualization (NFV), their foreseen challenges and their expected opportunities as well as the results from their initial trials. Additionally, it provided a broader and long term perspective on the networking ecosystem evolution as envisioned and realized by the EU FP7 Mobile Cloud Networking (MCN) project. The key take away messages are: Relevance of the SDN Northbound-Interface (NBI), which might result in multiple flavors for domain specific applications. The influence of virtualization techniques (SDN/NFV) on the next generation core networks (5G) have been discussed. Flexibility in terms of deployment models of OpenEPC early user data plane breakout close to the base station (eNB). The trade-offs between complexity, scalability, efficiency, reliability, security, flexibility and costs for virtualizing telecommunication networks are intensively discussed and require further proof of concept validations. The FP7 MCN project develops until end of 2014 an integrated multi-service virtualized mobile telecommunication environment including RAN, EPC, IMS and the data center aligned to the ETSI NFV Use-Case Trails. With the wide deployment of LTE and of 3GPP EPC, the operator network is now supporting massive broadband communication for a large number of subscribers. In order to sustain this evolution and to be able to cope with the afferent costs, new approaches have to be considered to further optimize the network. The three most pre-eminent of them are the Software Defined Networks (SDN), the Network Functions Virtualization (NFV), and Mobile Cloud Networking (MCN). With participation of more than 50 guests and speakers the international FI-PPP workshop successfully provided a comprehensive overview of the status of all currently running projects of the FI-PPP programme. By involving FIRE and EIT ICT Labs representatives, synergies and sustainability options were discussed and an outlook on the next phase was provided. The workshop started with an overview of the current status of the FI-PPP at programme level. Subsequently, the status of the FI-PPP Core Platform [FIWARE], FI-PPP’s Usage Areas [FISTAR, FI-SPACE, FI-CONTENT, FINESCE, FITMAN), as well as the status and achievements of FI-PPP’s Infrastructure and Capacity Building projects [INFINITY, XIFI] was presented. Also several European FI-PPP nodes that are and will continuously more and more be offering FI-PPP’s Generic Enablers for application development and deployment provided presentations about their status. Live demonstrations were present at the event and showed capabilities of FI-PPP node deployments [German FI-PPP Node] as well as Generic Enabler usage of Usage Areas [eHealth Use Case]. With representatives and presentations from the European Commission, FI-PPP’s programme-wide coordination action CONCORD, Europe’s Future Internet Research and Experimentation (FIRE) initiative, the European Institute of Innovation and Technology (EIT) ICT Labs several options for sustaining FI-PPP’s results, approaches for future exploitations were finally openly and lively discussed as well as synergies identified. Panel discussions about the upcoming phase III as well as best strategies for participation of SMEs concluded the workshop. 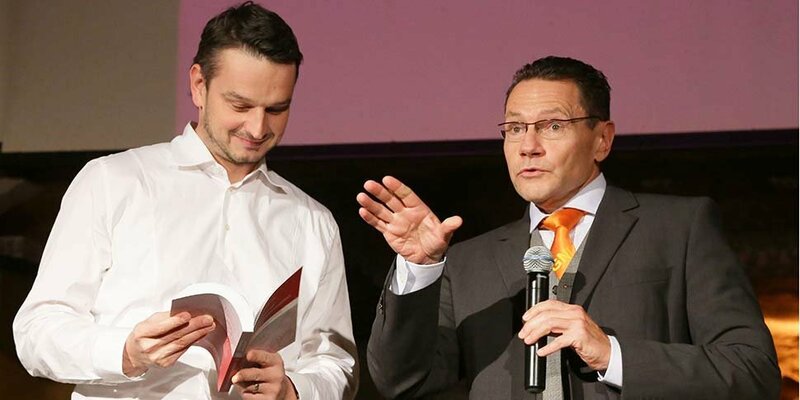 During the Social event in a famous Berlin After Work Lounge at Potsdamer Platz in the heart of Berlin, Dr. Heinrich Arnold, Director of the Deutsche Telekom Laboratories, confirmed the high importance of the main topics covered by FUSECO Forum for future telco business. The second day united the different tracks of the previous day under the main theme of this year´s FFF by a full day conference "Smart Communication Platforms for Emerging Smart Cities" which featured 18 presentations from various international network operators and standardization bodies. After the conference opening by Prof. Dr. Thomas Magedanz, Prof. Dr. Radu Popescu-Zeletin, Director of Fraunhofer FOKUS, delivered a keynote on “Smart Cities and the Role of Smart Communication Platforms”, illustrating the need for common ICT infrastructures as enabler the efficient provision of Smart City applications. The first session chaired by Prof. Dr. Noel Crespi from Telecom SudParis, France, addressed the Status Quo of Fixed and Mobile Broadband Deployment and Evolution Path. 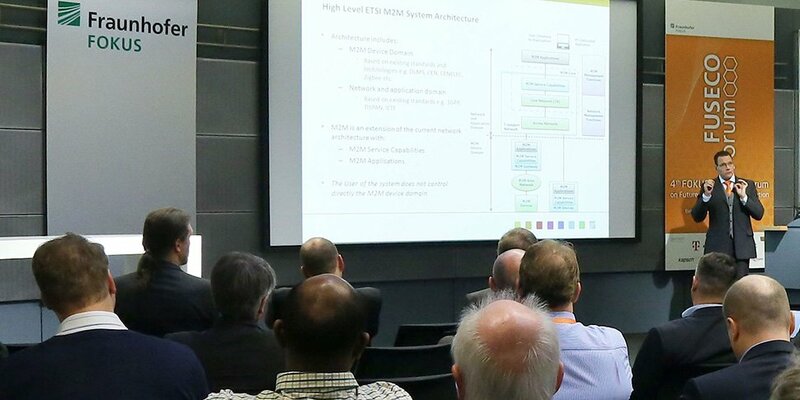 The presentation were given by the three major German mobile network operators and addressed topics like VoLTE and RCS deployment challenges on top of LTE as well a semerging latency requirments for 5G networks and Network Function Virtualisation (NFV). The second session chaired by Prof. Dr. Magedanz looked deeper at the SDN/NFVworked performed in NGMN Alliance and ETSI and looked on new open network API activities inside the GSMA and business aspects of IMS and M2M services. 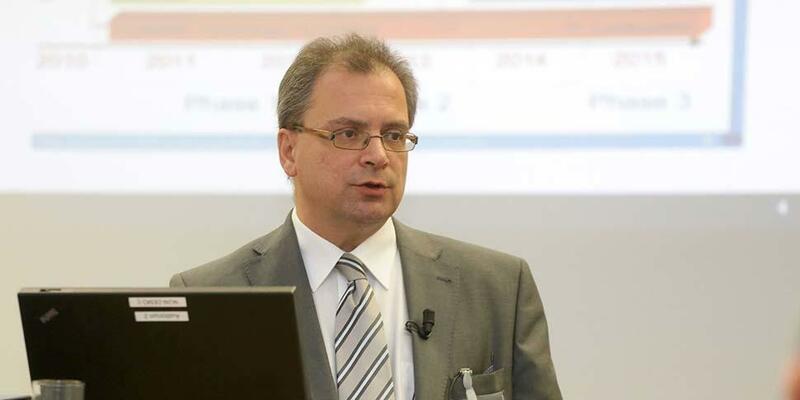 After the lunch break Dr. Anastasius Gavras – Eurescom, Germany chaired a panel discussion on "Do we need common Smart Communication platforms or will Smart Cities finally be a loose Aggregation of Smart Services? ", with experts from various Standard Bodies and network operators. The discussion revealed, that open data platforms are an important prerequisite, and that security will become an important aspect of the infrastructures. Prof. Dr. Stefan Fischer from the University of Lübeck, Germany has led Session 3 which provided talks on ongoing M2M standardisation work within 3GPP as well as emerging M2M platforms from Deutsche Telekom and Telefonica. The final session entitled Integration of M2M and H2H Communications within Smart City Infrastructures chaired again by Prof Magedanz looked at major international initiatives towards prototyping Smart Cities. Here the European Future Internet Private Public Partnership (FI PPP) initiative was presented and the related FI PPP Platform project introduced. Then various operators, such as Deutsche Telekom, Telkom Indonesia, True Corporation from Thailand, as well as Smart from the Philippines presented their plans and first provided Smart City services. Alongside the workshop the newest testbed toolkits from Fraunhofer FOKUS, namely OpenEPC Release 5 (www.openepc.net), OpenMTC Release 2 (www.openmtc.org), FUSECO Playground (www.fuseco-playground.org), WebRTC Telco Demo as well as the new OpenSDNcore (www.opensdncore.org) were practically demonstrated. Details on the program and impressions from the event can be obtained from the FUSECO Forum website (www.fuseco-forum.org/2013). 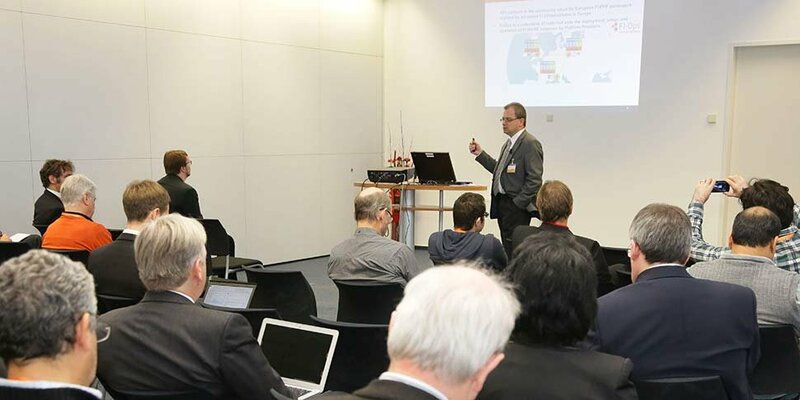 Due to the huge success, the FOKUS FUSECO Forum series will be continued in Asia in summer 2014 and again in Berlin end of November 2014. All three editors of the new Springer book LNCS Band 7768 / 2013 „Evolution of Telecommunication Services – The Convergence of Telecom and Internet: Technologies and Ecosystems“ were present to sign the book. FFF13 delegates obtained a four weeks free online access to the book.